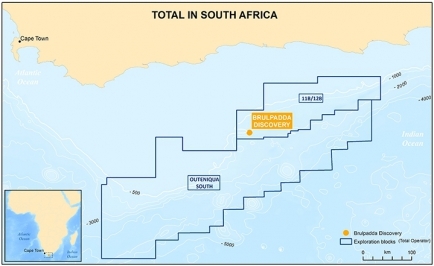 French energy company Total has made a "significant gas condensate discovery" offshore southern South Africa, it said February 7. The Brulpadda prospects are on Block 11B/12B in the Outeniqua Basin. The Brulpadda well encountered 57 metres of net gas condensate pay in Lower Cretaceous reservoirs. Following the success of the main objective, the well was deepened to a final depth of 3,633 metres and has also been successful in the Brulpadda-deep prospect. Total said the deepwater discovery opened a new world-class gas and oil play and was well positioned to test several follow-on prospects on the same block. It used the latest generation drilling ship and said it was able to leverage its experience in similar environments, such as the West of Shetland, UK. Visiting Total's facilities 180 km offshore February 2, the country's mineral resources minister Gwede Mantashe said it was one of the most important exploration projects underway in the country. "If we can discover oil and gas here, that will be a game changer for the country in terms of the economy. We hope that we will discover oil so that we can reduce our dependence on imported crude oil,” he said. In that respect he was not lucky. Following the success of Brulpadda and confirmation of the play potential, Total and its partners plan to acquire 3D seismic this year, followed by up to four exploration wells. The Block 11B/12B covers an area of 19,000 square km, inwater depths ranging from 200 to 1,800 m, and is operated by Total (45%) alongside Qatar Petroleum (25%), CNR international (20%) and South African consortium Main Street (10%). The CEO of Africa Energy (AE), Garrett Soden, said the success at both the Brulpadda primary and secondary targets significantly de-risks four other similar prospects already identified on the existing 2D seismic and that there was substantial follow-on potential. "We congratulate Total as operator for drilling the Brulpadda-1AX deepwater well safely and efficiently," he said. Africa Energy has 49% of Main Street and thus 4.9% of the project. Wood Mackenzie’s global exploration head Andrew Latham said Brulpadda had been one of Total’s biggest exploration targets this year. “Even though the well isn’t an oil discovery, if Brulpadda proves to be anywhere near as big as the estimates of up to 1bn barrels of oil equivalent resources, it will still be a game-changer for South Africa,” he said.